While there are many hedge mazes and labyrinths, this labyrinth is made of sunflowers. In the Philippines there are a number of larger fields that grow sunflowers as their bright and sunny display brighten up communities and campuses. In Pangasinan the grove of festive flowers has turned into the Tayug Eco Park, bringing the benefits of the sunflower to light along with other harvested flowers. To add to the benefit of the park, the flowers have been turned into a labyrinth and tourists flock from many areas to frequent the fun of the walk among the flowers. 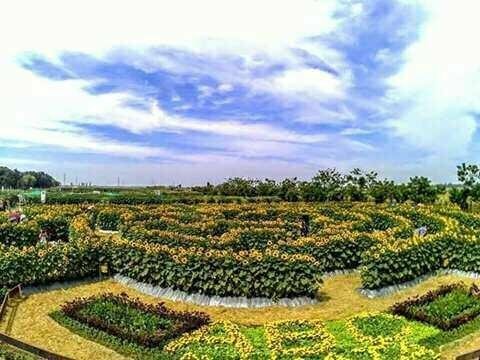 There are a number of other parks that have sprung up creating mazes out of their sunflowers, so the idea has grown in different areas of the Philippines. As a result of all this interest there is now a Sunflower festival that takes place and includes the labyrinth of sunflowers. Explore the ways you brighten up your own walk and community with a walk on the labyrinth.